Never mind Bitcoin, how’s this trade lamb! Home > Sheep > Never mind Bitcoin, how’s this trade lamb! 13 Dec Never mind Bitcoin, how’s this trade lamb! In last weeks comment we mentioned that the rain could provide a short-term boost to lamb prices, and indeed it did. We surmised that the extra moisture could see a pullback in supply with processors fighting it out at the saleyard, although that didn’t appear to be the case, signalling this week’s movement was demand led. Figure 1 shows the rainfall pattern for the week ending on the 7th of December and despite some areas not receiving the magnitude of rain forecast there was still some ample falls to much of Victoria and NSW. Despite the rain there was no detrimental effect upon supply in these states with Victorian lamb throughput up 19% and NSW lamb yarding up 4% on the week. The increased throughput having little impact on east coast lamb prices with the ESTLI climbing 3.5% to close yesterday at 635¢/kg cwt. – figure 2. The WATLI stronger too, posting an 11% increase to 640¢ as lamb throughput there trekked sideways. 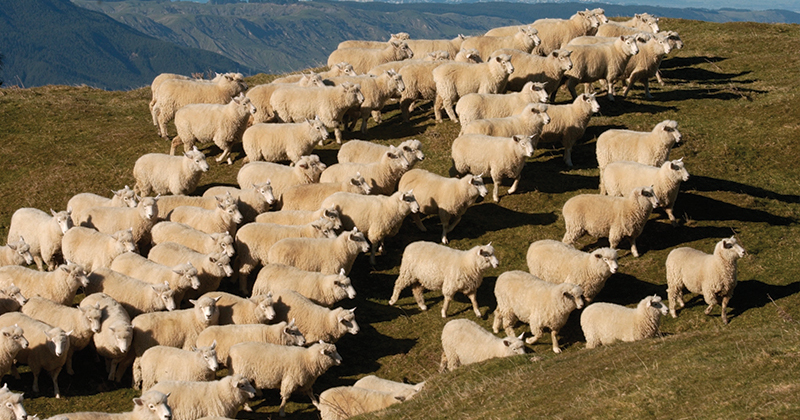 Mutton prices firming too on the week across the Eastern states in the face of higher saleyard volumes with the East coast mutton indicator up 3.5% to 487¢. West Australian mutton one of the few categories to see lower week on week throughput, falling 8.6%. The lower supply providing a boost to WA mutton prices – up 8% to 387¢. The strength of recent lamb and sheep prices no mean feat when you consider how much above the seasonal average the combined east coast throughout levels have been tracking of late – figure 3. Indeed, at sitting just shy of 385,000 head the East coast lamb and sheep yarding is 19% above the five-year average for this time in the season. Much lighter falls are forecast for this week across the nation with less than 10mm predicted for most of the sheep country. Its unlikely the magnitude of the recent price gains for the ESTLI will continue into next week, even with the seemingly robust demand. Trade lamb prices in excess of 630¢ are going to continue to encourage producers with capacity to deliver stock to keep coming forward. But as we often say, more supply now can mean less available for later. What this may mean for supply and prices as we head into 2018 is an exciting prospect for producers.